Ireland have now won five cycling medals in Rio. CYCLISTS KATIE-GEORGE Dunlevy and Eve McCrystal have won their second medal of the Paralympics by claiming silver in the Women’s B Road Race this afternoon. The tandem duo won Time Trial gold on Wednesday and followed that performance up with another stellar ride in Pontal, finishing 59 seconds behind the winner. It means Ireland’s medal total for this Games has risen to 10, which is two more than the target originally set by Paralympics Ireland. After the start was delayed and the route shortened to 75km due to an earlier crash, Dunlevy and McCrystal led from the front on the mountainous course to position themselves in the main peloton. It wasn’t until the final descent that they surrendered the lead as the Polish bike of Iwona Powkoscielna and Aleksandra Teclaw stormed to gold. Nevertheless it was another composed performance by the pair as they claimed Ireland’s fifth cycling medal in Rio. “I don’t know how we are going to celebrate but it means so much to us,” McCrystal said. Dunlevy added: “We’re absolutely exhausted, it was a hard race, probably one of the hardest races I’ve done but we’re ecstatic. Meanwhile, in the Men’s race there was bitter disappointment for Damien Vereker and Sean Hahessy as they blew their chances of a first Paralympic medal. The pair came out of the blocks quickly and established a lead of over a minute after the first 15km but a combination of the heat and exhaustion forced them to withdraw halfway through. Peter Ryan and Marcin Mizgajski came home in 12th place in the race that was won by Holland’s Vincent ter Schure and Timo Fransen. With one day left of the Games, the Irish team have won four gold, four silver and two bronze medals. Email “We've hit 10! Dynamic duo Dunlevy and McCrystal win silver in Paralympic Road Race”. Feedback on “We've hit 10! 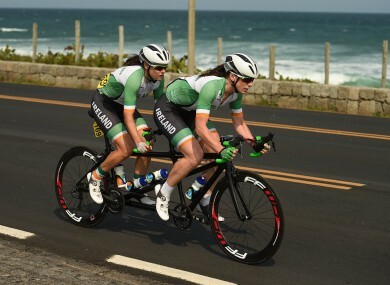 Dynamic duo Dunlevy and McCrystal win silver in Paralympic Road Race”.